Girls can build their very own unique structures with the Roominate Chateau! Using the included building pieces that easily snap together, girls can tap into their imaginations to design two-level structures, bunk beds, balconies, a house on wheels, and other endless possibilities. Teaches important STEM skills: hands-on problem solving, spatial and fine motor skills, self-confidence, and creativity. Electrical circuits enhance designs so girls can watch their creations come to life with real movement, including spinning windmills, carousels, lamps, and more. Included in this 131-piece set are 8 wall/floor panels, 52 furniture building pieces, 32 connectors, 4 arches, 4 wheels, 2 axles, a motor, string of 4 lights, 2 switches, 2 battery packs, a screwdriver, doll, pet, and 20 sheets of craft paper. Requires 4 AAA batteries, not included. The La Newborn Collection of Real Life Baby dolls introduces its newest addition. Dressed in a beautiful pink knit set, our La Newborn is as sweet as can be. This precious La Newborn features a new delightful expression and striking baby blue eyes that are sure to melt your heart! 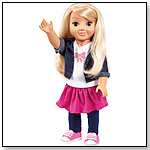 She is a 15" all-vinyl Anatomically Correct “Real Girl" with moveable arms, legs and head. She is made completely out of vinyl for easy care. This sweet little girl is all dolled up in a cute pink knit romper, matching chic cloche hat and booties. This amazing set also includes a matching knit blanket, so your child can swaddle her to keep her cozy and safe. 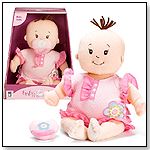 JC Toys is the leading online source for lifelike baby doll girls and accessories, and you’re going to love the incredible value that we offer for this adorable newborn baby doll set! 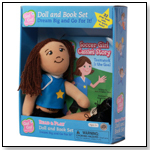 She is made in Spain and perfect for children ages 2+. Adorable white Kitty hooded Bathrobe, embroidered whimsical kitty face and ears on hood and slippers. Pink Satin Dress with organza overlay, pink satin bow on collar and matching handbag with bow. Pink rich satin, scoop neck, white lace overlay on neckline, sweetheart bodice, white lace overlay on front of full skirt and matching handbag. Adorable plush dolls from AURORA WORLD sport neon curls. Now available in key-ring size, too. The new Calin Ballerina features the same sweet-smelling baby doll you know and love, this time in a beautiful little ballerina outfit. The tutu is a one-piece, so you won't lose anything, not even the adorable ballet slippers. Black bodice, white short sleeves with pink trim, Soccer ball on chest. Black elastic waist shorts with pink trim on side panel. Soccer ball scaled to fit 18 inch doll. Includes: Top, Short and soccer ball. Arianna® original designs are designed to fit 18 inch doll like American Girl®, Adora Friends®, Our Generation® The Madame Alexander - Favorite Friends®,Gotz®, Journey Girls® Springfield Collection®. Boutique Quality - She's Worth it! Crisp white satin short sleeve ruche bodice, satin drape twist adorned with a elegant rhinestone notion and full tulle skirt with overlay. Chapel length veil with lace trim. Includes: Dress and Chapel Length Veil. Arianna® original designs are designed to fit 18 inch doll like American Girl®, Adora Friends®, Our Generation® The Madame Alexander - Favorite Friends®,Gotz®, Journey Girls® Springfield Collection®. Boutique Quality - She's Worth it! Viviana™ and Valentina™ are Vi and Va™! Two sisters and best friends with their cousins, Felicia™ and Roxxi™. Every day is an adventure and a reason to celebrate the bond of family and friendship.